(1) Players start at the hurdles. Ensure that they use their arms to drive them and maintain high knees to improve speed and acceleration. (2) The players then collect a ball and dribble them through the cones using quick feet and light touches using the inside and outside of the foot. Use arms for balance and keep your head focused on the ball and the cones. 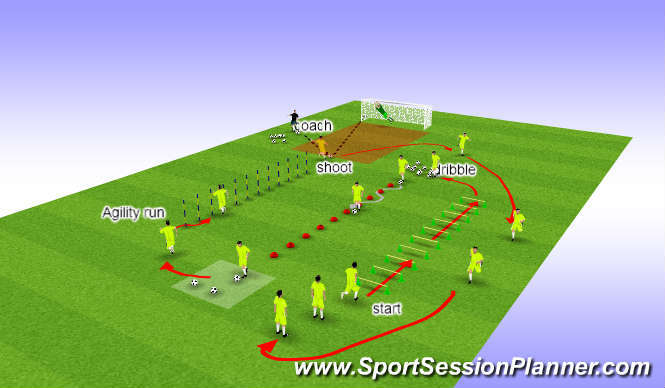 (3) The players leave the ball in the shaded area and then sprint as quickly as they can to the poles. They sidestep in and out of the poles improving their agility, again light on feet and use arms for balance and co-ordination. (4) When they reach the end of the agility run, the coachw ill play a firm pass into the player who then strikes first time at goal. (5) The player runs back to the start and the process continues. (6) Repeat three times, rest for 2 mins, repeat a further 2 times, rest for 2 mins, repeat 1 time then relax. -Emphasise the importance of maintaining all the correct techniques of each exercise throughout the circuit, especially when tiring towards the end.